Seventeen graduate students and recent graduates will participate in the yearlong California Sea Grant State Fellowship program at state and federal agencies throughout California, California Sea Grant announced today. This is the largest class of marine policy fellows in the program’s history. The California Sea Grant (CASG) State Fellowship Program provides the opportunity for highly qualified graduate students and recent graduates to obtain experience in the planning and implementation of marine and coastal resource policies in the state of California. Fellows are matched with a host agency and gain “on the job” experience during the 12-month paid fellowship. 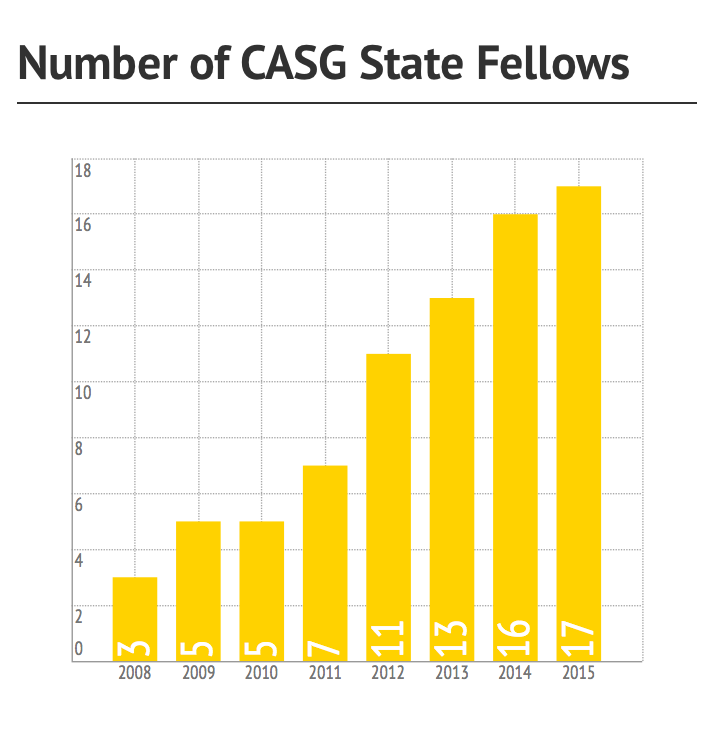 The seventeen recipients represent an increase of 12 fellows since 2010. “This program trains the next generation of ocean and coastal policy leaders,” Eckman said. Below are the names and host agencies of the 2015 California Sea Grant State Fellows. Alisan Amrhein earned a master’s degree in environmental science and management from the Bren School of Environmental Science & Management (specializing in Coastal Marine Resource Management) at University of California, Santa Barbara in 2014. Before graduate school, Amrhein interned with the Orange County Coastkeeper and was involved with the initial development of and data analysis for the MPA Watch Program, a citizen science program that monitors human activity in and around marine protected areas. At the California Department of Fish and Wildlife, Amrhein will be assisting in the development of a Fishery Management Plan (FMP) for the northern California red abalone fishery. Annalisa Batanides received her J.D. from University of California, Davis School of Law in 2014, earning the Environmental Law Certificate and Public Service Law Certificate. She earned her B.S. from University of California, Davis in 2010. Previously, Batanides has worked as a legal clerk for Earthjustice, the Sierra Club and Tri-Valley CAREs. As a State Fellow with NOAA Fisheries Office of Aquaculture, Batanides will help to develop and implement policies to foster marine aquaculture while ensuring that aquaculture complies with existing federal laws and regulations. ocelyn Enevoldsen earned a master’s degree in environmental science & management (specializing in coastal marine resource management) from the Bren School of Environmental Science & Management at University of California, Santa Barbara in 2014. Prior to pursing graduate school, Enevoldsen worked as a scientific aid for California Department of Fish and Wildlife, collecting data about recreational fishing in the Santa Barbara Channel. At the Coastal Conservancy, Enevoldsen will help coordinate wetland restoration projects throughout Southern California and help support stakeholder involvement in the regional management of Southern California wetlands. 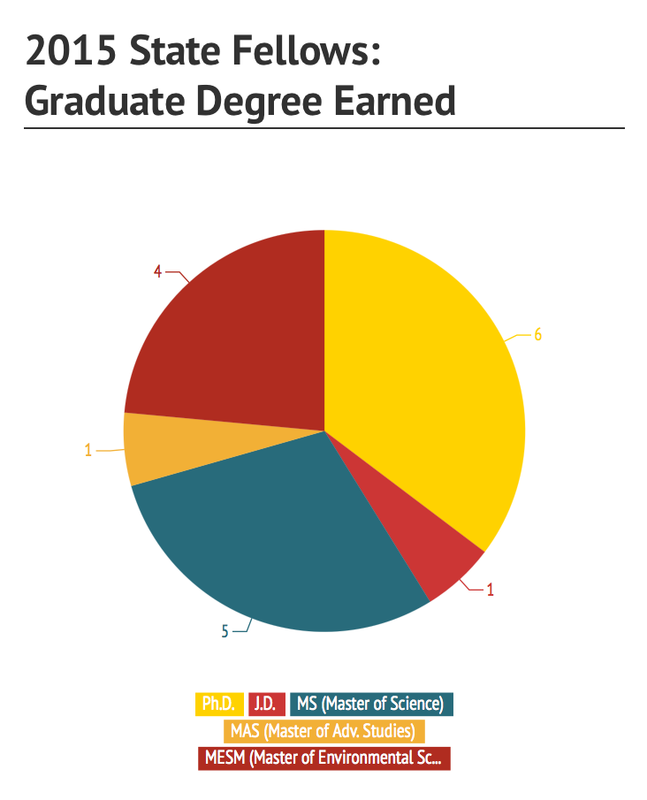 Lauren Garske earned her doctorate in ecology from the Bodega Marine Lab at the University of California, Davis in 2013. Her thesis focused on modeling nearshore water quality and predicting ecological zones of impact, as well as studying the flow of scientific knowledge in decision-making at the National Marine Sanctuaries Program. Garske’s work at the Coastal Commission will focus on the agency’s climate change program and likely include an emphasis on science translation for broader audiences. Maya Hayden will earn her doctorate in environmental science, policy, and management from UC Berkeley in Spring 2015. Her dissertation research focuses on the importance of secondary locations for seedling establishment of pioneer riparian trees in managed river systems, where human impacts have significantly altered the natural disturbance regime and regeneration dynamics. While her dissertation research focused on the Sacramento River, Hayden has previously worked on wetland and riparian restoration and management projects from the Sierras to the San Francisco Bay. As a Fellow for the NOAA San Francisco Bay and Outer Coast Sentinel Site Cooperative, she will be leading efforts to facilitate the exchange of climate change-related tools and information between NOAA agency scientists and regional decision makers in the Bay Area. These efforts will focus primarily on improving community and regional resilience to sea-level rise and coastal inundation. She will also collaborate with California Sea Grant Extension Program specialists on outreach and education programs that complement the Sentinel Site Cooperative mission. Morgan Ivens-Duran earned a Master of Science in biological sciences from California Polytechnic State University at San Luis Obispo in 2014. Her thesis explored how Marine Protected Area (MPA) implementation on the Central Coast affects regional recreational fishing dynamics. At the Ocean Protection Council, Ivens-Duran will work to strengthen community and natural resource agency involvement in long-term MPA management, assist with West Coast Governors Alliance on Ocean Health, and help coordinate the Thank You Ocean Campaign. Daniel Livsey will earn a doctorate in geology from the University of California, Santa Barbara in 2015. Livsey studied past changes in the coastal systems of Baffin Bay, Texas to illuminate future response to changing sea -level and climate. During his fellowship at the Delta Science Program, Livsey will determine how science is being used in Delta ecosystem restoration and water management decisions, develop and implement performance measures for the Delta Science Plan, work with interagency groups to develop models and decision support tools, and develop science communication products for a wide range of audiences. Jonathan MacKay earned a master’s degree in environmental science from California State University, Los Angeles in 2014. While in graduate school, MacKay interned with the Los Angeles Waterkeeper Oil Spill Prevention and Response program. His thesis work modeled an oil spill in Santa Monica Bay, examining oversights in policy and analyzing the ecological effects on protected species and areas. At the California Department of Fish and Wildlife, MacKay will use policy, outreach, and marine spatial planning to engage stakeholders, protect the environment, and guide aquaculture activities in the state. Brenna Mahoney Rudd earned a doctorate in ecology and evolutionary biology from University of California, Santa Cruz in 2014. Mahoney Rudd’s studied the spatial and temporal variability of kelp forest community interactions for her thesis. She currently serves on the board of directors for the Center of Oceanic Awareness, Research and Education, a non-profit focused on protection of marine resources. During her fellowship, Mahoney Rudd will help implement the third funding round of the California Coastal Conservancy's Climate Ready Grant program as well as support programs on climate change issues such as adapting to sea level rise and reduction of greenhouse gasses. Elena Perez earned a Master of Advanced Studies in marine biodiversity and conservation from the Scripps Institution of Oceanography at University of California, San Diego in 2014. Her research analyzed the economic and environmental impacts of an artisanal fishery in Fiji. At the California Coastal Commission, Perez will be involved in a broad range of coastal and ocean regulatory issues, with a focus on environmental justice. Heather Perry earned a master’s degree in environmental science and management from the University of California, Santa Barbara in 2014. During graduate school, she specialized in Water Resources Management, while conducting a group thesis project on incorporating land use impacts on biodiversity into a Life Cycle Assessment. Heather previously interned with the Colorado State Land Board under the conservation services manager, and prior to becoming a Sea Grant Fellow, she worked on the San Onofre Nuclear Generating Station (SONGS) wetland mitigation monitoring project at the Marine Science Institute of UCSB. At the San Francisco Bay Conservation and Development Commission (BCDC), Heather will be working on several projects revolving around regional sediment management in the San Francisco Bay Estuary. Specifically, she will be composing GIS visualization products to help inform areas of concern with regard to sediment dynamics, helping to plan and develop the second phase of a "State of the Sediment" Workshop, and developing a tool to assist flood control agencies with regulatory issues when developing innovative projects. Nicole Russell earned a doctorate in earth sciences from the University of California, Santa Cruz in 2014. Russell’s dissertation research studied California sea-level rise vulnerability and adaptation, and El Niño forecasting. Russell will lend her expertise in sea-level rise to the California Collaborative on Coastal Resilience's Humboldt Pilot Project and will work on the Marine Protected Areas Partnership Plan. Nick Sadrpour earned a Master of Science in coastal and watershed science and policy from California State University, Monterey Bay in 2014. During graduate school, he functioned as the Technical Services Biological Division graduate student intern for the California Coastal Commission. As a State Fellow with the Ocean Protection Council, he will work on managing grants geared towards updating local coastal programs with a focus on climate change and sea-level rise. Jahnava Duryea earned a Master of Science in marine science from Moss Landing Marine Laboratories at San Jose State University in 2014. During graduate school Duryea worked as an onboard scientist conducting fishing surveys in the Central California Rockfish Conservation Areas to track the abundance of overfished species. Previously she worked as a subtidal technician for UC Santa Cruz chapter of Partnership for Interdisciplinary Studies of Coastal Oceans (PISCO) conducting SCUBA surveys of Central California nearshore fishes, invertebrates, and algae. At the Delta Independent Science Board, Duryea will help review the scientific research and monitoring of water supply and quality in the Sacramento-San Joaquin Delta. The Delta ISB’s legislatively mandated reviews focus on how climate change and adaptive management are being incorporated into coequal goals of water supply reliability and ecosystem health. Kim Tenggardjaja earned a doctorate in ecology and evolutionary biology from the University of California, Santa Cruz in 2014. Her dissertation focused on understanding how populations of coral reef fishes are genetically linked throughout the Hawaiian Archipelago and relating this information to the design of marine protected area networks. As part of the Ocean Standards Unit at the State Water Resource Control Board, Tenggardjaja will be working on developing and implementing state policies under the California Ocean Plan, which protects water quality in coastal waters. Morgan Visalli earned a master’s degree in coastal marine resource management and strategic environmental communication from the University of California, Santa Barbara in 2014. For her thesis, Visalli developed a bio-economic model to evaluate the feasibility of turning fish discards into valuable aquaculture feed ingredients in small-scale fishing communities in Baja California Sur, Mexico. Visalli will support the team at the Channel Islands National Marine Sanctuary in hosting a multi-stakeholder collaborative process and using a scientific ocean planning tool, SeaSketch, to explore solutions that align multiple human uses in the Santa Barbara Channel and minimize impacts to the marine environment. Sean Windell earned a master’s degree in applied marine and watershed science from California State University, Monterey Bay in 2015. He studied the value of habitat diversity in marine reserves, specifically the spiny lobster use of the intertidal zone at the Santa Catalina Island marine protected area. At the Delta Science Program, Windell will help improve salmonid and sturgeon monitoring and assessment in the Delta and Sacramento River with the intention to inform management decisions.